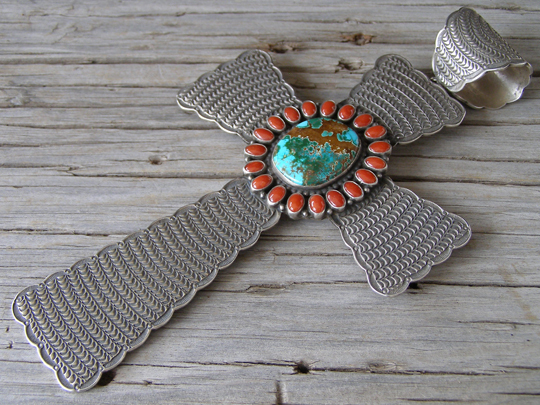 This is an over-sized cross pendant by Matthew Charley set with a large two-tone stone of natural, untreated Royston turquoise surrounded by 19 ovals of Mediterranean red coral. Matthew is know for the exacting fish scale stampwork which creates beautiful texture on this scalloped-edged cross. The extra-large bale is made from the same weight of silver as the pendant and employs the same fish scale stampwork for decoration. The bale of this pendant will accomodate 16 mm. diameter beads, though our oxidized beads of 12 mm. diameter are perfect for this (see below). This is a large, impressive piece that would be perfect when strung on large Sterling beads. Hallmarked Matthew Charley in script and stamped Sterling on back. Red coral: 19 ovals 1/4" x 5/32"
Dimensions of cross (excluding bale & jump ring): 5 5/8" x 3 3/4"